23 Jul 74 Change of command, Capt. Joseph C. Winsett assumed command of AFTN from Major Melvin A. Bailey. 12 Aug 74 Change of command, Major John M. Lewis, Jr., assumed command of AFTN from Captain Joseph C. Winsett. 16 Sep 74 Received 13 AF/XP message of AFTN consolidation into 6204th Aerospace Support Squadron at Clark AF, PI. Completion date 15 November l974. 23 Sep 74 Recommended consideration for use of either SEAN--South East Asia Network in lieu of AFPN-American Forces Phillipine Network and AFTN-American Forces Thailand Network as the network identifier upon consolidation of the two units. 9 Nov 74 Satellite feed football games on 9 Nov and 21 Nov marked the first time color VTR replays were available for Thailand. TV engineers and IVC 870 VTR machines were deployed from Thailand and immediately recorded the games in color for playback in color the next day. Nine (9) unmanned repeater stations at Lop Buri, Chiang Mai, Kokha, Sattahip, Don Muang Airport, Bangkok, Warin, Samaesan Army Station, and Ramasun were considered satellite stations. 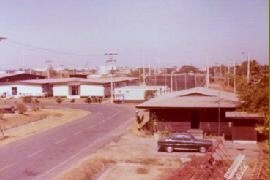 The satellite stations in Thailand were the responsibility of Korat, U-Tapao, Ubon, and Udorn affiliate stations. Early 75 Sgt Rik Delisle does the last newscast from Korat for the AFTN network. 3 Feb 75 Request for speakers sytems for AFTN signal to Tavich and USMAG/MACTHAI compounds in Bangkok. Mar 75 Final equipment arrives for completion of closed circuit completion of closed circuit radio cable system for Kokha, Thailand. 12 July 75 Army manning in Thailand will not be addressed y the Army. 10 Oct 75 NKP FM radio operations signed off at 2400. 13 Jan l976 Thailand radiated broadcasting deadline set to cease 20 March l976. 15 Jan l976 Closed-circuit radio for residual Thailand forces initiated. Those sites included Ramasun, and U-Tapao, and CCR's at Bangkok, Ko Kha, and Chiang Mai. 30 Jan l976 6204AEROSS wins unprecedented three out of five Air Force Information Media Awards. 8 Feb l976 6204AEROSS TDY engineering team begins installation of Ramasun television facility. Korat radio ceases local studio originated broadcasting. Network news preparation/dissemination responsibility shifts to U-Tapao. 20 Feb l976 PCA/TASA engineers begin on-site survey for closed-circuit radio network in Thailand for residual forces. 6204AEROSS orders continued radiated broadcasting in Thailand beyond 20 March cessation deadline. 31 March l976 U-Tapao, last television station of 6204AEROSS in Thailand, ends broadcasting. 23 May l976 Final closure of AFTN with U-Tapao signing off the air. The chapter on the American Forces Thailand Network, one of the largest US Air Force broadcasting networks ever, signs off the air on May 23, l976.